In the Missal used at Tours before the Tridentine reform, the Sequence of the feast of St Martin begins as follows. Gaude Sion, quae diem recolis / Qua Martinus, compar Apostolis, / Mundum vincens, junctus caelicolis / Coronatur. Rejoice, o Sion, who recall the day when Martin, equal to the Apostles, overcoming the world, is crowned among those that dwell in heaven. The first Responsory of his Office also compares Martin to the Apostles, although somewhat more obliquely. R. Hic est Martínus, electus Dei Póntifex, cui Dóminus post Apóstolos tantam gratiam conferre dignátus est, * Ut in virtúte Trinitátis Deíficae mererétur fíeri trium mortuórum suscitátor magníficus. 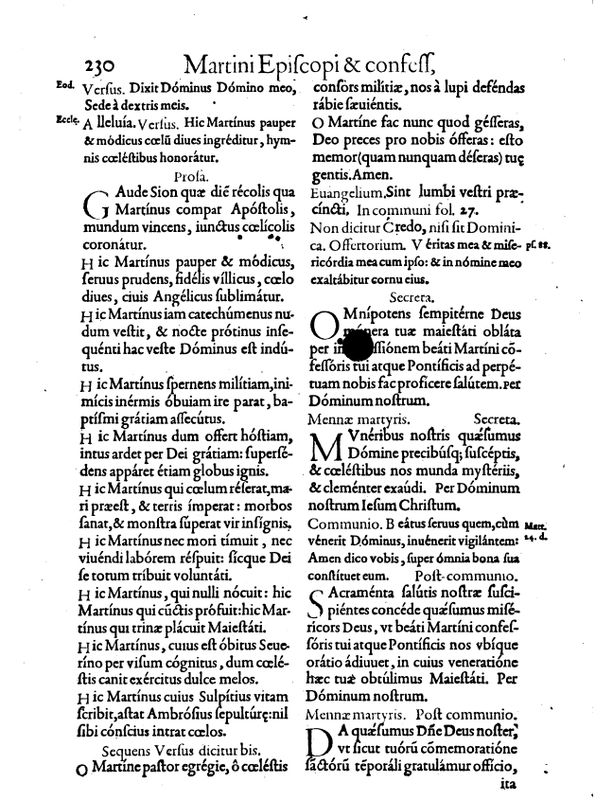 V. Sanctae Trinitátis fidem Martinus confessus est. Ut. R. This is Martin, God’s chosen Priest, upon whom, after the Apostles, the Lord deigned to bestow such great grace, * that in the power of the divine Trinity, three times he merited gloriously to raise the dead to life. V. Martin confessed the faith of the Holy Trinity. That. 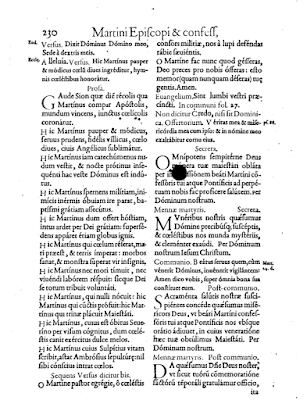 Durandus also notes that among the feasts of Confessors, only Martin’s was considered important enough to be kept with an octave, as was the general custom in the Middle Ages, and in many places well beyond that. It was also the only feast of a Confessor kept with a proper Office in the medieval use of the Papal chapel at Rome, which formed the basis of the Tridentine liturgical books; not even the four great Doctors or Saint Benedict have their own Offices in the Roman Use. Ad sacrum cujus túmulum frequenter / Membra languentum modo sanitáti, / Quólibet morbo fúerint graváti, / Restituuntur. At whose sacred tomb the members of the sick are now often restored to health from whatsoever ailment weighed them down. 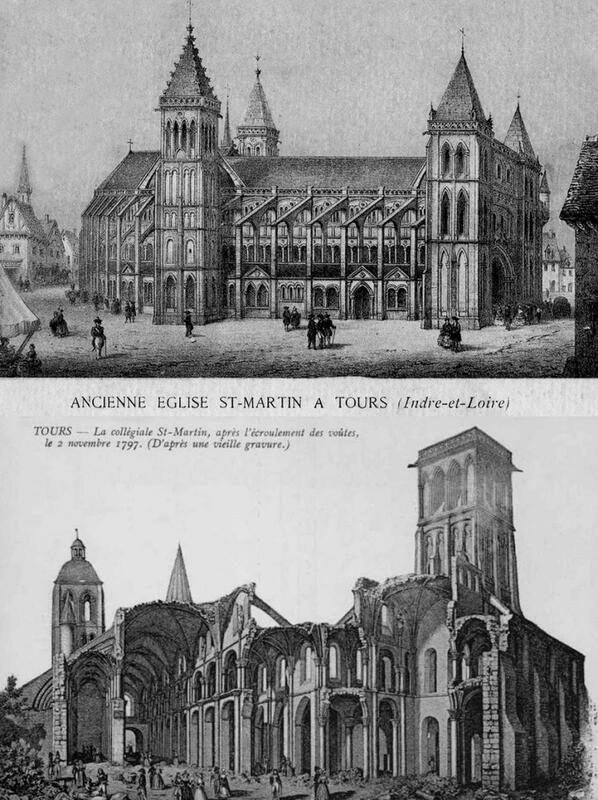 The basilica of St Martin at Tours was one of the most important pilgrimage shrines of the Middle Ages, and as the hymn notes, particularly renowned for miracles of healing. Not by coincidence does the Mass of St Martin share some of its parts with that of another famous wonder-worker, St Nicholas, who is named right after him in the Litany of the Saints. A great many medieval Uses also kept a second feast of the Saint on July 4, which commemorated two events: his episcopal ordination in 371, and the translation of his relics on the same day about a century later, roughly 70 years after his death, from his original burial place to a large basilica built over it. This church was rebuilt twice, in 1014, and again in 1230 after a fire, each time on a larger scale. It was not, however, the cathedral of Tours, which is dedicated to St Gatian, Martin’s predecessor-but-one as bishop; his own church, while very important, was at first a monastery, and later a collegiate church. For much of the Middle Ages, the area around it was known as “Martinopolis,” later “Chateauneuf” (New Castle), and legally a separate city from Tours. An indication of its importance is the fact that the abbey had the right to mint its own coinage, known as the “livre tournois” (the “pound of Tours”, like the English pound-sterling), which became the coin of the realm in France, and remained so until the Revolution. Sadly, both the tomb and the relics of St Martin were mostly destroyed when the church was sacked by Protestants in 1562; the basilica itself was then razed during the French Revolution. A modern church was built to replace it in the later 19th-century; of the original there remains only the towers built on either side of it. Engraving showing the basilica of St Martin above. and the ruins of it after the first wave of destruction in the Revolution. A huge number of other churches throughout the world are dedicated to St Martin; Dom Guéranger states that there were 3660 in France alone. He shares a basilica in Rome with Pope St Sylvester I, traditionally said to be the first Pope who did not die as a martyr; they are the first Saints to be honored as “Confessors” in the traditional sense of the term, and their church was the first in Rome not titled to a Biblical personage or a martyr. The feast of Pope St Martin I, the last Pope to be martyred, is kept the day after Martin of Tours, even though he died on September 16, because his relics were placed in the church of his holy namesake. St Bede states that a church dedicated to St Martin of Tours in Canterbury was the very first ever built in England, dating back to Roman times (and of course, if this is so, originally under a different dedication.) It was from there that St Augustine of Canterbury began the evangelization of that country. 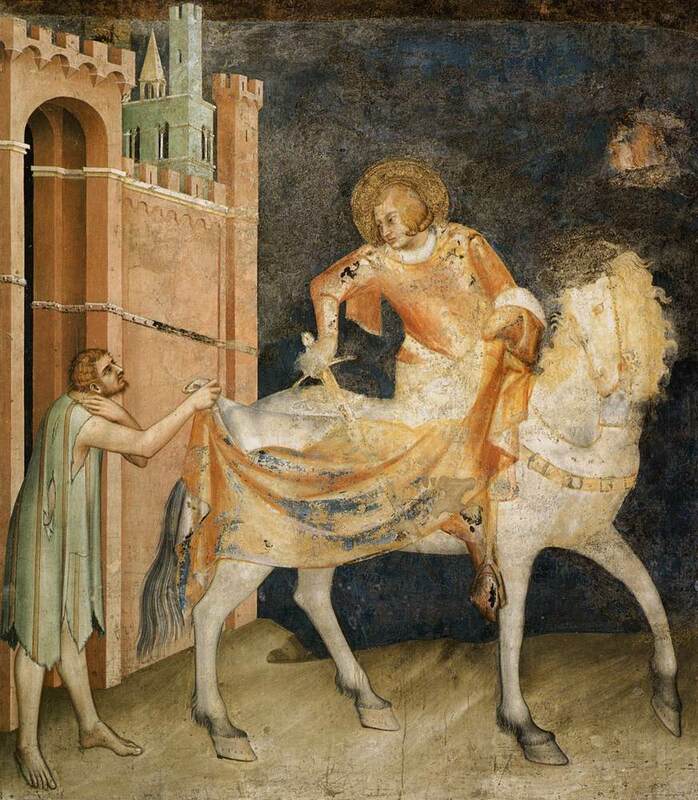 St Martin Divides His Cloak with a Beggar, by Simone Martini, in the lower basilica of St Francis of Assisi, 1320-25. The liturgical calendar also served the Middle Ages as an almanac for weather and agriculture, with many rules, customs and proverbs bound to certain feasts. One French tradition says that if there is a full moon on St Martin’s day, the winter will be very snowy. In Italy, his feast is connected with the opening of the “vino novello – the young wine”, which is to say, wine made earlier in the same year, generally very light in alcohol content. An Indian summer may also be called “St Martin’s summer” in England, and this is the standard term in Portugal and Italy, which is having a beautiful one this year (to make up for a brutal July and August.) In Milan and Toledo, his feast is the key to the beginning of the liturgical year, since the six-week long Advent of the Ambrosian and Mozarabic liturgies starts on the Sunday after his feast.